I am pretty excited at the moment. My Christmas gift, given in the form of gift cards, and finally actually ordered is on it's way. I knew when the gift card arrived exactly what it would be used for: a Brother LB-6800THRD Computerized Sewing and Embroidery Machine (the picture is from the Costco website). I'd been eyeing the machine on Costco.com for months, but the machine definitely wasn't in our budget. Yet I'd sew and imagine monogramed creations (I have a major weakness for monogramed anything). Before the gift card I couldn't honestly justify the purchase though, simply based on the embroidery feature. I can make the sewing machines I have now do everything that I need them to do. Someday I hope to have a sewing machine counter (in the far off future) where they're all lined up and ready to be used at a moment's notice, and I can snap a photo to show on my blog. At the moment I haul out whatever sewing machine is being used, and place it on Sadie's little play table (which is tiny!) and sew there. It isn't the ideal work space, but it works for now. At the moment my sewing arsenal includes a serger (and I've been so busy I haven't yet gotten to sit down and read the manual, and after my experience with my first ever sewing machine I've learned that for me, the manual is important when it comes to sewing machines! ), a Bernina industrial sewing machine from the 1930s (I googled the type once and found the actual year!) that belonged to my great grandmother (it weighs about 70 lbs which makes moving it a bit of a challenge! But it's so beautiful! ), and a simple kenmore that belonged to my grandmother and my mom and that I tune up regularly, but that I'm in constant fear is just about to kick the bucket. And what if all the sewing machines cease to run at the same time?!?!?! (although I realize that this is highly unlikely...). My aim is to sew at least four hours a night, so that is surprising amount of wear and tear (as I learned with my first Singer, which died after a few short months of all night sewing... and created my phobia of having orders and no sewing machine to sew them on). Has 70 built in designs, 5 fonts, and 120 frame patterns! And it speaks 16 languages (LOL!). And then it has a lot of the things that I didn't really care about, but that will probably be pretty neat, like a push button thread cutter and a "super easy" bobbin winding system (okay, so I've never actually thought, "wow, it's really hard to wind that bobbin..."). Best of all, it comes with a 25 year warranty! Now I just have to wait for it to arrive. And I have to find someplace to put it. The Kenmore spends it's spare time in a baby bassinet.... It looks like I have some organizing to do! Some day you are going to need a sewing room. I can't wait to see what kinds of embroidered creations you will make. You may want to rethink storing the sewing machine in the bassinet. Things were stored in our original bassinet by the people we gave it to, who subsequently gave it back, and it made the floor of the bassinet sag so badly that we couldn't use it for our new baby. You will have more business than you know what to do with when you start monogramming things. You will be the exclusive outfitter of all my future children!! I know how that feels, to be getting a really wonderful new sewing machine. I did my big purchase over a year ago as a present to myself for finishing graduate school and I don't think it possible to make a machine better suited to the way I sew. I had intended to go on pilgrimage to Rome when I finished grad school but pregnancy kinda put that in a box for later. 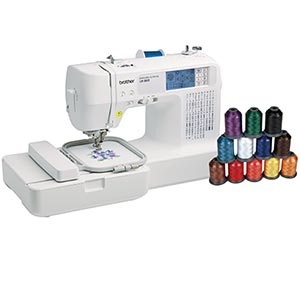 So I got the machine and then a small portable one for sewing get togethers (yeah, we have those here where one of the gals with room invites everyone to bring projects and machines to her house and we spend hours together sewing and talking-- those are fun). The little machine is totally basic but light enough to put in the car. I keep admiring your etsy stores. Drooling... pardon me... I have a mild crafting affliction/addiction. :) Congrats on your new toy! Martha is right; this is going to definitely increase your business!